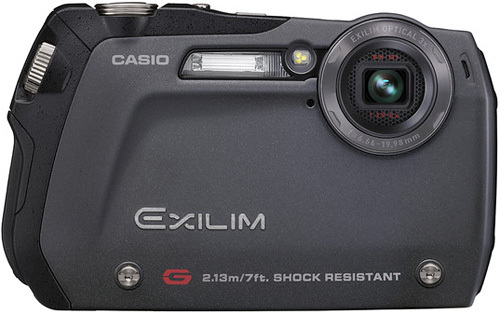 Casio Announces The EX-G1 Shock-Resistant, Waterproof, Dustproof Digital Camera | OhGizmo! Clearly targeted at consumers who are living a more extreme lifestyle than I do, the new Casio EX-G1 features a shock-resistant shell allowing it to survive drops from as high as 7 feet, or being submerged up to 10 feet underwater for as long as an hour. The waterproof seal also keeps out dust, and the camera is rated to survive temperatures as cold as -10 °C, which isn’t actually that cold, though it is below freezing. As for tech specs, the EX-G1 features a 12.1MP sensor that’s also able to capture 30fps AVI videos at 848×480, 3X optical zoom using an internal mechanism so the lens doesn’t actually extend from the body, and all the other features you’d expect to find on a reasonably equipped P&S digital camera these days. The choice to use microSDHC and microSD memory cards is a bit odd, though I imagine it helps keep the camera compact. 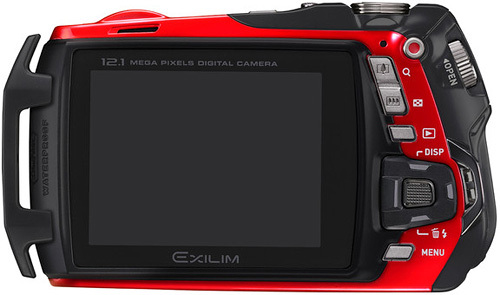 The Casio EX-G1 should be hitting shelves sometime in December of this year in black or red for $299.99. Now that's a cool camera. I'm like a chick when it comes to cameras, if they look cool then they must be good. I don't think it's because I'm a chick that I like it. I think the features and protection it offers is amazing. The design is decent and not horribly bulky like most rugged electronics are. The price is comparable with other cameras on the market and I believe this is a better deal. Now if only it was a Cannon…I like the user friendly ability of Cannons, the interface is so much cleaner and user friendly that it's always a must when I buy cameras. I just purchased a Canon d10 for my wife, who is prone to dropping her cameras (and electronics in general) and the image quality is damn good! A lot of our shots are in bars and at night, and though many “rugged” cameras have fared poorly in this area, the d10 consistently surprised me the last time we took it out. It doesn't look as cool as this one, but having survived three or four falls so far, I'm a happy man! Oh wow, like a sport car it even have a spoiler on it. It must be good. Then again lots of front wheel drive Civic have spoiler on the rear. Heheh. I planned to by myself an olympus crash-proof camera, but now it seems that i have a contender….